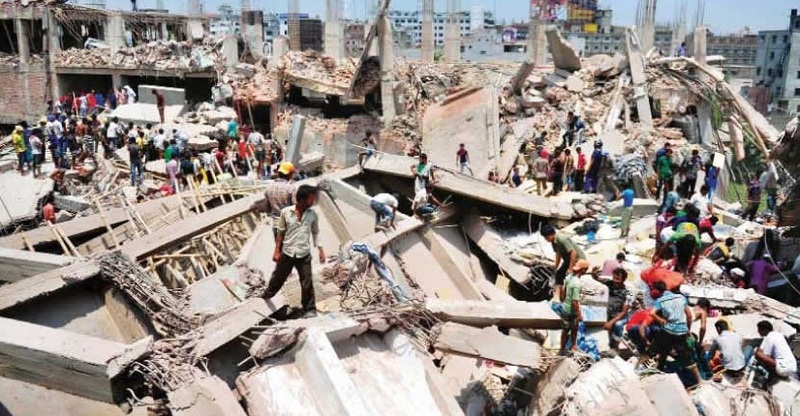 “Pro-Hartal activists were shaking the pillars, which may be why Rana Plaza has collapsed!”, a minister said. I, too, have gained an engineering certification from the Bangladesh University of Engineering and Technology (BUET). There is a fair chance that this will be read by my teacher Professor Jamilur Reza Chowdhury or renowned architect Professor Shamimuzaman Basunia. I was not a great student in BUET. But, however weak a student I may have been, I can guarantee that a nine storey building will not fall if ten people shake one of its columns with all their force. But one does not have to be a Professor of Political Science to say that the minister’s comments could cause a government’s fall. The collapse of Rana Plaza repeatedly reminds me of the last line from W.B Yeat’s poem – Things Fall Apart – everything falls down. One of Chinua Achebe’s books has the same title. Humyoon Azad wrote a book named ‘Demolish Everything’. Who grabbed whose land? Who filled the pond with what? Isn’t it illegal to fill in wetlands? Who gave them permission to build the building? Which architect did the design? Which structural engineer did the structural design? Who approved it? What was the motive behind construction of that building? Why were factories allowed in an office-building? Specially with a high density labor force and machines which emit excessive heat? What did the Labor Ministry do? What did RAJUK do? I have often said in my columns that in Dhaka and its surroundings, where land is more expensive than gold, where the cost of living is expensive, why would multi-storied buildings be built? Raw materials for garment factories come from overseas, and the finished goods are exported overseas; shouldn’t these factories be developed around seaports? So much money is being earned, please relocate garment factories from Dhaka city, from commercial and residential buildings. Who will listen? The gold laying goose won’t die by itself. Greed and sin will slaughter it. And poor workers. Oh, my worker brothers and sisters. Sacrificing childhood-teen-youth they work hard wholeheartedly, under intense heat of light – how much do they get? Where do they live? What do they eat? Who looks after their health? We never asked – the wheel is moving, the bobbin is moving, the stitching-needle is going up and down, earning foreign currency. We see Mercedes and BMWs in the streets of Dhaka, and we see other exclusive cars for which we do not know the names. Some of us also get a share of this opulence when it overflows. We also get to ride in cars. Inequality is extreme. But negligence, injustice and unethical attitudes are much more extreme. We are living over a pile of gunpowder. Our well tended garden will end, if the garment-workers get together and come out to take their revenge for this deprivation. Just as we have sent the poor orphans to Qaumi Madrasas, where we never wanted to know how they were. We did not keep informed of what they study, what they think. Now, when they came out in numbers it gets us thinking or may be not. And party politics is responsible for everything; democracy has been turned into plunder-cracy; the end of the rule-of-law, limitless greed, lack of compassion, dispossession of lands, bribes, corruption, dereliction of duty – in other words chaos. Yet, I have hope. The Fire Service workers, construction workers and ordinary people risks their lives to enter the ruins to rescue people. Many rushed with blood and oxygen cylinders. Many are looking for ways to donate financial support. As this compassionate attitude still exists among the general public, the sun still rises, dawn breaks, birds sing.